Oh yeah. I remember my best shot. Outside of Houston. Twenties on the rail in a call the shot game, and I had spots. 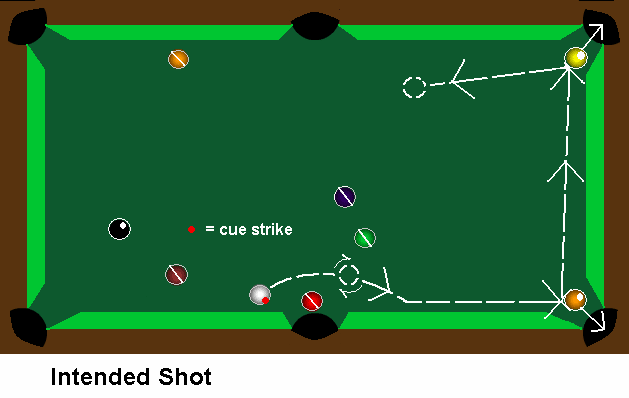 Two spots were sitting in adjacent corners at the end of the table, and a stripe was next to the side pocket. 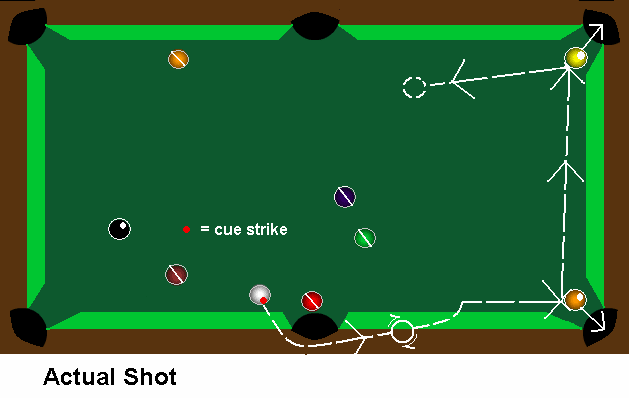 I was blocked for the far corner, my cueball was on the wrong side of the near pocket and against the rail, and I couldn’t bank the corner shot. What could I do? I did what any bluffer would do. Call both corners. With my cue in the air, I jammed a Massé shot. 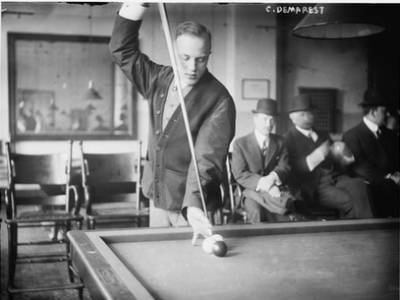 Put so much spin on the cue ball that it hopped the rail in front of the side pocket, rode it and spun back down to the table on the other side of the side pocket and caught the side rail. It sunk Spot 1 in the near corner, then shot down the end rail to sink Spot 2. No scratch. Of course I had to keep a poker face, so I walked to my next shot as if nothing spectacular had happened. Within seconds everyone grabbed their money and went upstairs. Game over. THAT was my best shot. This entry was posted on Sunday, 5 June 2011 at 12:05 AM and is filed under Cool, Humor, Logic, Real News, True Stories. You can follow any responses to this entry through the RSS 2.0 feed. You can leave a response, or trackback from your own site. Awesome story, complete with diagrams. Good times. Necro– It’s one of those stories that you can’t prove, but you know it happened because you were there. Like getting hit in the chest with a hackysack while drinking a Long Island Iced Tea, reacting, bouncing it back into the players’ group without spilling a drop… and never having played the game. Like having a friend give you a bunch of crap because there’s no ice in his drink and tossing an ice cube into his glass from across the room. Like having a roommate brag about hitting the bullseye in a dart game, and nailing the end of his dart with yours.